Please suggest anyone to do Mantra at home daily for Memory, Concentration and Brain-Power? Since last few months I couldn't remember such a small things in my daily life. Meaning : We meditate upon that Supreme One, who has the neck and face of a horse and who is the embodiment of JnAnA (divine Knowledge) and AnandhA (Bliss). He has a divine akaram (body) like a radiant, blemishless Spatikam (Crystal) and is the abode of all VidhyAs (branches of Learning). This slOka set in the Vedic anushtup meter is the dhyAna slOkam for BhagavAn HayagrIva. Meaning : I seek refuge in Lord HayagrIvA, whose divyAtvam, Suddha Satthva SvarUpam is the embodiment of pure and unalloyed dhivya Jn~Anam. As the overflowing treasure house of DayA, He has taken the sankalpam to bless the chEthanams with His rejuvenating blessings of dhivya JnAnam that will liberate them from the cycles of births and deaths. To fulfill His vow to liberate them from the darkness of ajnAnam, He stands as their beacon light, their sole and final refuge to bless them with dhivya JnAnam. I am also desiring that divine and redeeming dhivya JnAnam and surrender at His lotus feet. Meaning : Oh Lord HayagrIva! It is said that Brahma Deva encodes the lot in one’s life on the skull at the time of birth (Brahma Lipi). The chEthana’s life is laid out in those instructions. Those lipis (aksharams written on the skull) interfere with the pursuit of Moksha Sukham and the performance of Tapas that would qualify one to realize such a ParamAnugraham.The jeeva suffers from the cycles of births and deaths (SamsAram). MokshAnugraham recedes farther and farther. The incomparable power of the sacred dust from Your lotus feet changes however the fate of the Bhaddha jeeva. BrahmA and other DevAs adorn the sacred dust from Your holy feet to overcome their misfortunes. May the power of those dust from Your sacred feet (PaadhAngri rENu) settle permanently on my head, erase the Braham Lipis and bless me with Moksha. Meaning : In His beautiful, lotus soft four hands, Lord HayagrIva sports Sudarsanam, Paancha-janyam, JnAna Mudhra and a Book. He is seated on a freshly-blossomed White Lotus and reminds the UpasakAs of the whitest-white fragment of a freshly cleaved spatikam. His lustre never ever fades. There is no limit (boundary) to His blemishless glories. May This Lord of Vidhyais shower on me His nectarine, white and cool rays! May He reside and preside over my hrudhayAkAsam in this manner! Among Vedic deities Goddess Saraswati is considered as the Goddess of knowledge,wisdom ,learning,eloquence,memory and is associated with virtually any activities which are related to the brain. Goddess Saraswati is depicted as the bestower of Jnana(wisdom),Smriti(memory),Vidya(knowledge) & Kavitwa Shakti(the power of poetry). She is also depicted as the "Adhistatri of all Vidyas" and as "Akshara Swarupa"(the Personification of alphabets). She is depicted as the embodiment of Smriti Shakti,Jnana Shakti,Buddhi Shakti and Kalpana Shakti and also as the ruler of tongue,mind,thought,speech and anything to do with brains. 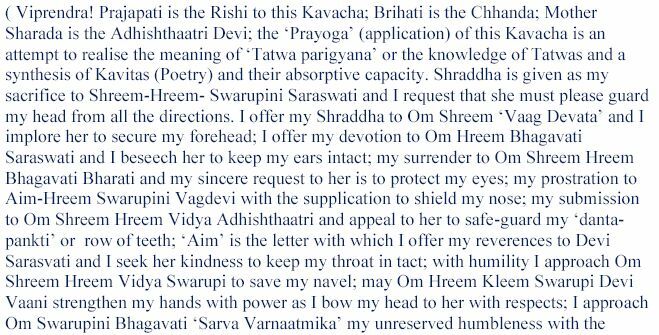 The following Kavacha is found in the Brahma Vaivarta Purana.Lord Brahma is the seer.The Phalasruti states reciting the kavacha yields memory power,mental sharpness and immense knowledge(exactly the things you are looking for). You can also refer to the Saraswati Stuti by Rishi Yajnavalkya given in this answer. If reciting stotrams is too cumbersome for you then just recite her mantras.Refer to my comment. Edit:- I'm adding yet another stotram that increases wisdom, memory, brain power ,intellect etc.Its called the "Pragnya Vivardana Karthika Stotram"(The stotram that increases Pragnya or wisdom) dedicated to Lord Shanmuga(Karthikeya). This paryer to Lord Subrahmanya helps one increase their intelligence and wisdom. It is said that even a mentally retarded child would become normal by reciting this prayer. 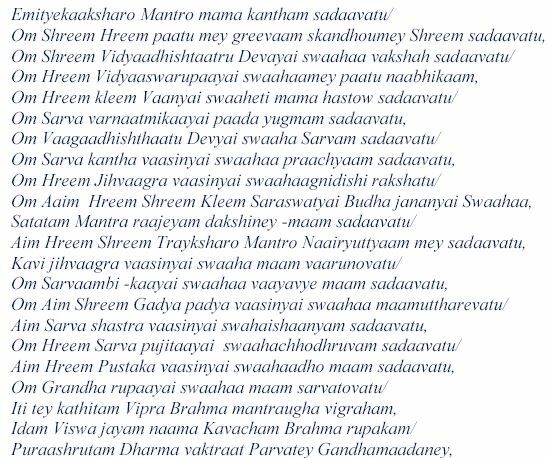 The prayer is taught by Lord Subrahmanya himself and identifies 28 names of Lord Subrahmanya1. Meaning-These names composed by me, If sung, Would make one extremely intelligent. But having said that,Its Saraswati who is the embodiment of Smriti Shakti,Jnana Shakti etc.If you want to excel in studies or any other work that requires intellectual proficiency then its her to whom you need to pray to. What mantra should students follow before any examination? Is there any clean procedure by mantra (Sudhhi Mantra) for Mala of Rudraksha?